rather than color to create the intended mood. Most of my work is monochromatic. 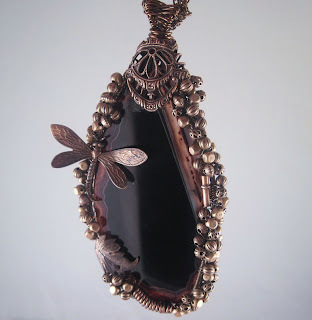 I use aged patinas and various textures to create jewelry with a sense of history. My salvage pieces are intended to have a dark and mysterious aura to fit the Victorian/Industrial nature of their design. Color makes an strong statement. Choosing the appropriate one to complement the mood of the piece is important. Black and white are the most common colors that I use. Black crystals, beads made of onyx and obsidian, gleaming pearls, and clear quartz all make lovely accents. wire and encrusted with beads of the same color. A jewel of the sea in bright bottle green. Color makes a bolder statement in my wire wrapped pieces. Here you will find colorful slices of agate and those lovely gems of the sea, beach glass. These uncommon jewelry components exhibit bold and happy colors. They are wrapped in bronze, copper or sterling silver wire and sometimes encrusted with metal beads but I rarely add other color to the design. This post is part of a blog carnival. Read how other Starving jewelry Artists use color in their work by following the links below. I love how you use different metals and patinas to create subtle color palettes. I absolutely love that monocromatic look for vintage and victorian era pieces. You do it so well, Bonnie! I noticed myself that I had some monochromatic themes going on... could be something about that! :) Great post. When we think of colour we think "bright" but I loved reading your perspective of how colour can define and give definition to piece, fabulous post. So interesting, thanks for sharing. I have never thought about monochromatic looks that much, but you sure make them look good. Love your dark and mysterious colours, the agate pendant is super.